Sof'Bounce is an attractive recycled-rubber product that is one of the most economic and nontoxic products in the market today. Sof'Bounce is long-lasting and comes in a variety of vibrant colors that won't rub off on hands or clothing and does not deteriorate, freeze or become brittle in cold conditions. It prevents mold fungus growth and does not attract animals or termites. RB Rubber Products, Inc. has been a recycled-rubber products market leader since 1985. 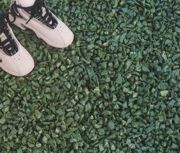 Providing safety surfacing with RB Bounce BackTM playground tiles and RB Rubber Mulch and Playground Cover, the products meet ASTM and CPSC guidelines. TotTurf® by Robertson Industries, Inc. is a leader in poured-in-place safety surfacing. Using high-quality raw materials, the surfacing is made to withstand extreme temperatures and year-round use. TotTurf® stays in place year after year with little maintenance and upkeep. Robertson is IPEMA-certified, and its products meet all ADA and CPSC accessibility and safety guidelines. There are few other playground surfacing companies that offer the durability, aesthetics, performance and safety that you get from the TotTurf® product line. IMC is a manufacturer of loose-fill rubber playground surfacing. Choose from various rubber products and colors to fit your needs for surfacing and for your budget. 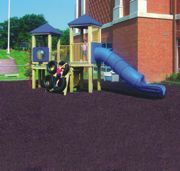 The two main lines, Rubberific Mulch and NuPlay, are ADA-compliant with head-impact ratings that are second to none. Rubberific Mulch is a tire buffing, which is shaped to resemble the shaved look of wood mulch. NuPlay is a rubber nugget material capable of taking a fall of up to 13 feet with only a depth of 6 inches. No Fault Safety Tile is another option in the many quality surface applications that No Fault provides for playground surfacing. Regarded as an industry leader, No Fault has been an innovator within the safety surface industry for more than 19 years. No Fault possesses a dedication to service and quality and a commitment to safety, while maintaining a style that sets its products apart from other surface companies. The playground pictured serves as a creative play area and demonstrates how this facility stands apart from others, with its emphasis on safety and originality, as No Fault Safety Tiles can provide. Fibar Systems® is a leading supplier of playground safety surfacing throughout the United States and Canada. Fibar Systems® are designed to be safer than sand, pea gravel and mulch, and they are ADA-accessible. Fibar Systems are all-natural engineered wood fiber systems that are shock-absorbing to reduce risks of injuries from falls. They are simple to install, easy to maintain and inexpensive. The Fibar Systems 300 comes with a 25-year warranty and product liability insurance. When 12-year-old Fibar was tested to the ASTM F 1292 standard for impact attenuation, it cushioned 45 percent better than new material.